After Lay's tried in vain to get the nation to embrace cappuccino-flavored chips, America seemed collectively poised to let the very idea of sweetened potato-based snack products fade into obscurity. 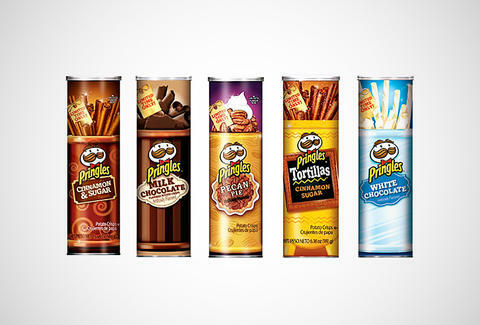 But it wasn't meant to be, because Pringles is rolling out five flavors of holiday-themed snacks, including two new, sweet varieties: Milk Chocolate and Tortillas Cinnamon Sugar. The Milk Chocolate Pringles are not, as you would probably guess, chocolate-dipped, but rather only chocolate-flavored, much like the cappuccino ones were. Will these fare better in the minds of American eaters? Only time will tell. As for the Tortillas Cinnamon Sugar Pringles, they're not the Pringles you're used to -- actually, they're tortilla chips that are dusted with cinnamon sugar. The two new flavors (available only at Walmart this season) join regular Cinnamon & Sugar, White Chocolate, and Pumpkin Pie to fill the holiday lineup, and possibly your stomach. Adam Lapetina is a Food/Drink staff writer for Thrillist, and hasn't stopped having fun since he first popped a Pringles can. Read his musings at @adamlapetina.